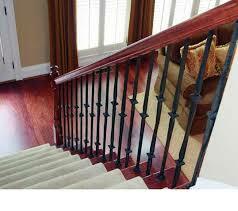 Wrought iron is a classic accent that has been used to beautify homes for centuries. 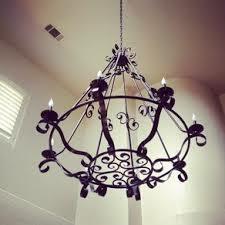 The strong and simple elegance of wrought iron is a wonderful addition to any modern home. It can be incorporated into home design in many different ways. Wrought iron railings are durable and can be fabricated in many beautiful designs. These types of railing have been a popular choice in home design not only for aesthetic reasons, but also because of their strength. Staircases are also an excellent place where wrought iron and wood can be combined to create eye-grabbing features in modern architecture. I can’t tell you how many of our friends have installed wrought iron balusters in place of the old wood ones. Their staircases look fabulous and this is on our short “to-do” list! Some designers like to showcase the entry of a home with an impressive chandelier. The theme is easily carried through a home by using wrought iron lighting fixtures in the dining room, hallways, and kitchen. Impressive outdoor fixtures and light posts can light the way for visitors to your doorstep. Wrought iron is a simple, strong, and beautiful addition to a modern home. It is a great way to add appeal and value to your house and property. Make a call to your trusted local real estate agent if you’d like more information on this or other real estate topics. This entry was posted in Fine Homes, Housing Trends, Lifestyle and tagged inexpensive home upgrades, lifestyle, stair railings, wrought iron. Bookmark the permalink.